In the Bible, the book of Psalms is perhaps one of the most evergreen prophetic verses in the old testament. 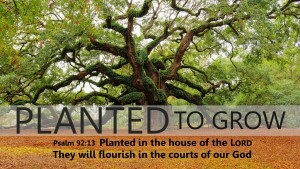 Psalm 92 talks about being fruitful at every stage of your life. Psalms 92:12-14 tells us how God has a plan for your life and a way of using you*. You could be a Hindu, a Moslem, a Sikh or a Christian. No matter what we call Him, we are but clay in His hands. The true test of a believer is when you live your life as if it were your last. In the past, every time I was in a difficult situation, I'd curse God because I felt He was not protecting me from evil. Like a capricious child, I would fret and frown about why He abandoned me. My daily prayer time would be another opportunity to blame Him and justify myself and promises to be good and do good and offer more tithes. Sounds familiar right? Over time, I realized that Gods sovereign rule will reign over our lives and He positions us exactly where we have to be at that point of time. The bedrock of Christianity is - Continuous spiritual growth and fruitfulness does not come automatically. But then again, if you look carefully this is the foundation of all religions too. In John 12:24, we read about how to be fruitful we have to die to this world. Surprisingly this explains the fundamental beliefs of jihadis and religious fanatics. What this scripture actually means is to detach yourself from the tentacles of this world so that you can be truly spiritually fruitful. To be selfless, start with being less selfish. Social scientists have proven that each person has a direct influence on 20 different people. Over the past several years of blogging, I've made good friends with people from around the world. Anonymous people who share my views on several things. Now, I've never met these people, but the bond we share is no less strong. Today as I write exclusively on spirituality, I feel I am finally getting to do God's will in my life. But I was not always this way. It took years and months for me to get to this point where I could write about His word. Like bamboo that takes months and weeks to build roots and Palm trees that take 15-30 years to be productive, as a young believer I needed years of TLC from Him to get to where I am today. As a writer, this is how I serve Him. And the best part is - God promises us that whatever we do in His name will flourish. How powerful is that! Verses 13-14 tells us that He is willing to use us anytime and anywhere. Looking back, I can now see how he has used me when I was going through painful separations from parents and loved ones, and I now realize that He put me through this so that I can now speak about it and comfort those who are going through pain in their lives. Author and christian minister Matthew Henry wrote 'The last days of saints are sometimes the best days and the last walk the best walk'. So why is He giving us all this? Surely, there could be something that He wants from us, right? Yes, there is. Like a parent who gives everything to their child but wants nothing but unabashed and unconditional love in return, God wants us to glorify him. That's all! In all that we do, He wishes that we glorify Him. Today, if you are wondering how He can use you where you are at this moment, consider this thought - Trees are not planted by accident and mountains are not an anomaly. You don't have to be a theologian. Like everything in nature on earth and in the little we know but cannot fathom and the vast universe of what we do not know, you are not an accident. Why? Because if God could place us on a planet that was just the right place at the right galaxy on the right constellation on the right universe, then He surely has a massively grand plan for YOU*. God gives us the reason for lively praise for his goodness towards us and whether you are young child growing up or an old person into your sunset years, know that the best is yet to come when you let Him. *But are you willing to let Him use you?